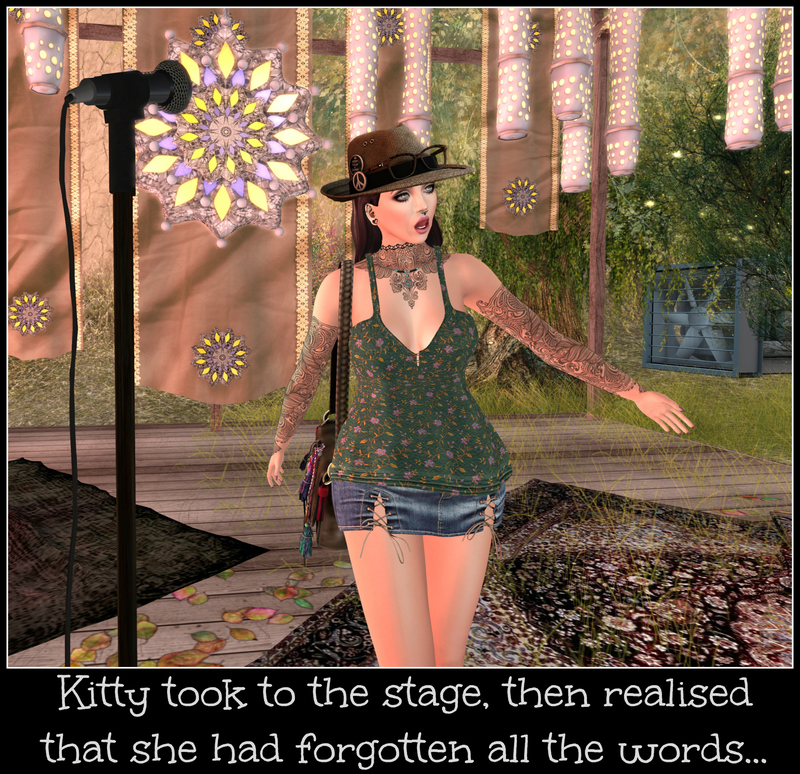 It is incredibly easy to become jaded by events in Second Life, I know I am as guilty of that as the next person, but when an event launches that is as special as INDIE TEEPEE then it is worth your time and effort to check out. I think it’s going to be the hot ticket event of the month, and it will surely benefit from frustrated avatars who can’t get into HAIR FAIR 2015. Can’t get in to buy fabulous hair? No problem, get yourself over to INDIE TEEPEE instead! One of the things I really like about this event is the website. I cannot tell you how many times I’ve visited an event’s website and been left feeling frustrated by the lack of information. I’ve also visited many a website and become completely perplexed by the layout and what it is trying to tell me. Not so with anything on INDIE TEEPEE’s website because it’s a thing of beauty and really easy to navigate, bursting at the seams with content. There are podcasts, a Spotify playlist, a full schedule and profiles of various avatars that have been involved in the production of this event. Care has been taken to produce this website, and it shows..but does it show at the event too? You can enjoy many activities at the sim such as watching machinima or exploring some of the artworks that are on display. You’ll be able to watch the machinima on the big screen under the stars from the comfort of the back of a pimped-out truck, or a picnic blanket. There are a number of art installations to view and explore at the event; my personal favourite is ‘Muses’ by BryneDarkleyCazalet which is an interactive artwork featuring some inspiring female musicians. I like this because it features a number of my own personal favourite artists (Kate Bush, Siouxsie Soux, Bjork and Debbie Harry amongst others) and I find it the most personally resonant art on display at the event, but all of the pieces look spectacular against the desert backdrop. Because this is a festival you can be assured of some fantastic live music and DJ sets. There really does seem to be something for everyone at each of the three stages. I’m looking forward to hearing some tunes, and perhaps taking in some of the live Roller Derby action that is being hosted at the event. I’m also looking forward to the events that are going to be held at the Literary Corner too. There’s a giant copy of my favourite novel of recent years (and I’m currently enjoying it in audiobook form read by Wil Wheaton) ‘Ready Player One’ by Ernest Kline overlooking the comfy cushions and the campfire that decorate the area. Nothing has been overlooked here at the INDIE TEEPEE event, and I’m actually really excited about it. Many years ago The Guardian newspaper held ‘Secondfest’ in world, which was a cracking virtual festival where I made life-long friends. I really hope that INDIE TEEPEE proves to be the same! What do you wear at an event such as this? Well, festival chic obviously, and you’ll be able to stock up on that at the event shops. Take stacks of Lindens guys, because the shopping is good! Some of the best content creators in Second Life are participating and you can be assured of some fabulous finds. I found a fantastic summer top from APHORISM at the event. The ‘Sun-Kissed’ top comes in 5 pattern colours (Yellow, Black, Green, Pink and White) and 5 plain colours (Blue, Crimson, taupe, White and Black) and is quintessential festival wear. I opted for the flowery print in loose cotton which while simple perfectly encapsulates the festival vibe. (I teamed it with my APHORISM ‘Glastonbury’ boots, an old favourite of mine, these boots are the kind of virtual fashion that beg for close attention. Zoom in to catch all the details and you won’t be disappointed!) The boots and top look perfect with an epic INDIE TEEPEE festival-find, the stunning ‘Haight-Ashbury’ leather bag with an embellished pattern from REVERIE that really does need to be seen to be believed. Last but not least you’ll need a hat to give you some relief from the sun in the desert heat, and I found the perfect hat in the shape of a rather glorious fedora by REMARKABLE OBLIVION. Yes, it’s a fedora but no, it doesn’t require tipping, OK? You’ll find a full list of participating shops HERE. So, all that’s left for me to do is wander the area, taking in the sights, sounds and smells of this festival. I’m so happy that this has been created and built in Second Life, it really does look absolutely stunning and I hope it lives up to my expectations. You know, I have a feeling it will actually surpass them..I do hope so! I’ll meet you there by the porta-loos..
All About Alex – Introducing Genesis Labs Latest Male Mesh Head! I know right?! Seriously though, it looks like it’s going to be fantastic! I’m looking forward to it immensely!